George's corner of science and health / exceptional people / environment / humanity in pictures: Planet or plastic? 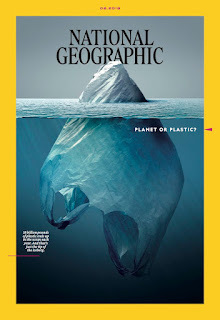 For its June 2018 cover and part of its "Planet or Plastic?" initiative, the magazine published a cover that is been widely shared on the internet and described as "dire" and "brilliant." Created by Mexican artist Jorge Gamboa, the photo-illustration features a plastic bag partially submerged in the ocean, suggesting that the world's plastic pollution problem is "just the tip of the iceberg."